The big-money closer is becoming extinct. Oh, the dinosaur still roams the ninth inning, and occasionally even the eighth. Reports of the species’ demise might be premature, considering that supply is overwhelming demand this offseason, depressing some free-agent prices. The big-money closer cannot be called extinct when the Tigers gave Joe Nathan a two-year, $20 million contract at age 39. When the ever-efficient Athletics will pay Jim Johnson more than $10 million on a one-year deal. When the ever-extravagant Dodgers will pay Brian Wilson $10 million to be their setup man. Still, Grant Balfour’s new deal with the Orioles is instructive. Balfour, who turns 36 on Dec. 30, is 62 for 67 in save opportunities with a 2.56 ERA the past two seasons. Yet the Orioles got him for two years, $15 million — a far cry from, say, B.J. Ryan’s five-year, $47 million free-agent contract with the Blue Jays after the 2005 season. Ryan was six years younger than Balfour, helping explain the differences in their respective deals. But over the past several years, the perception of a ninth-inning reliever’s value within the industry also has shifted dramatically. Clubs view most closers as volatile, unworthy of major investment, creations of the well-intended but flawed save rule. One executive likens closers to “shooting stars,” a description that actually could be applied to most relievers. Free-agent left-handers such as Boone Logan and J.P. Howell are drawing salaries of $5.5 million or more in their new multi-year deals. Big numbers, perhaps even excessive. But not as excessive as the money that teams once awarded closers. Consider Jonathan Papelbon, who signed a four-year, $50 million free-agent contract with the Phillies after the 2011 season. Just two years later, the Phillies are eager to trade Papelbon, who no longer is the same pitcher and is now 33. Mariano Rivera, perhaps the most reliable closer in history, never earned more than $15 million per season. The Braves’ Craig Kimbrel seemingly is on track to top that, but in this new, enlightened age, it seems doubtful any team would pay him that much even for historic performance over 70 to 80 innings. Kimbrel projects to earn $7.25 million in his first year of arbitration, according to MLBTradeRumors.com. ESPN’s Buster Olney recently wrote that the Braves should move him as quickly as possible before his salaries rise and his trade value plummets. I take something of an opposite view: I would offer Kimbrel an extension with $12 million salaries in his free-agent years, and dare him to say no in this new environment. Again, it’s difficult to make any outright pronouncements; five pitchers with 33 or more saves hit the open market this season, and two others (Johnson and Addison Reed) were traded. That’s an extraordinary number of available closers, and it should come as no surprise that the game of musical chairs could force an accomplished free agent such as Fernando Rodney to scramble. Then again, the high number of free agents is partly attributable to the reluctance of clubs to sign closers to long-term extensions. Think about it: Why do so few elite starting pitchers become free agents? Because their clubs assign them great value, and lock them up before they become free agents. Teams in need of closers, on the other hand, can hunt for bargains in a flooded market. The Indians signed John Axford for $4.5 million, the Cubs got Jose Veras for $4 million. Meanwhile, Rodney is still available, and so are Kevin Gregg, Chris Perez and Joel Hanrahan (Joaquin Benoit is expected to sign with the Padres). The big-money closer is not extinct. But the Orioles, in trading Johnson to the Athletics, actually got two relievers, Balfour and Ryan Webb, for the price of one. Clubs no longer wish to pay dearly for ninth-inning unpredictability. Efficiency, thy name is not closer. The way the Rangers see it, they’ve taken their best shot at free-agent outfielder Shin-Soo Choo. Their next target will be Japanese right-hander Masahiro Tanaka, assuming he is posted. Of course, the bidding for Tanaka also figures to include the Yankees and Dodgers, Angels, Diamondbacks and Cubs, and heaven knows who else. Tanaka, 25, effectively would become the youngest free-agent starter, and teams could acquire him without trading any players or losing any draft picks. Say he goes for six years, $120 million on top of his $20 million posting fee. 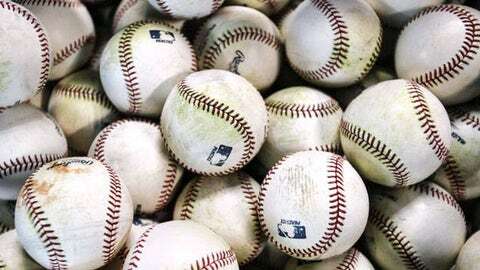 The combined $140 million investment would be the fifth-highest in history for a pitcher, trailing only the contracts for Justin Verlander, Felix Hernandez, CC Sabathia and Zack Grienke. The Rangers already have succeeded in assimilating a Japanese pitcher, right-hander Yu Darvish. Tanaka and Darvish used to work out at a winter camp in Japan for top Japanese players. But money, naturally, is expected to be the driving force in Tanaka’s market. The good news for the Rangers is that they could always circle back to Choo if they fail to get Tanaka, assuming that the outfielder is still available. The Rangers, at the moment, do not appear seriously involved in trade discussions for Rays left-hander David Price. Should they strike out on Choo, Tanaka and Price, they simply would preserve their prospects and financial resources for later moves. For an example of how the Tohoku Rakuten team’s decision on Tanaka is holding up the entire free-agent market, just consider how the Angels are handling their efforts to land another starting pitcher and a designated hitter. The Angels seem to be delaying the signing of a DH such as Raul Ibanez until they know how much they will spend on a pitcher. That pitcher could be right-hander Matt Garza, in whom they have heavy interest, sources say. That pitcher also could be Tanaka. The risk in waiting is that the Angels could lose their top candidates for DH — Ibanez, Mark Reynolds and others also are drawing interest from other clubs. Signing Garza could enable the Angels to move quickly. But then, presumably, they wouldn’t get a crack at Tanaka. Looks like Jackie Bradley Jr. will be pretty much on his own in center field for the Red Sox. While free agent Rajai Davis appeared a logical fit for Boston before he signed with the Tigers, the addition of a right-handed-hitting center fielder would make the Sox’s roster somewhat unwieldy. A spring-training trade for the Dodgers’ Matt Kemp could alter the equation, but at the moment such a move remains unlikely. For now, the Sox’s roster includes four outfielders — Bradley, Shane Victorino, Jonny Gomes and Daniel Nava — as well as Mike Carp, who appeared in 41 games in left last season. The infield, meanwhile, is full, and will remain that way even if the team re-signs Stephen Drew and trades third baseman Will Middlebrooks. Perhaps the greater intrigue with the Red Sox is what will happen with their rotation. They’ve still got six starters for five spots, not including right-hander Brandon Workman, who will be stretched out as a starter this spring, or any of their top prospects. A trade remains possible — the Red Sox are checking in with teams that need starters, sources say. 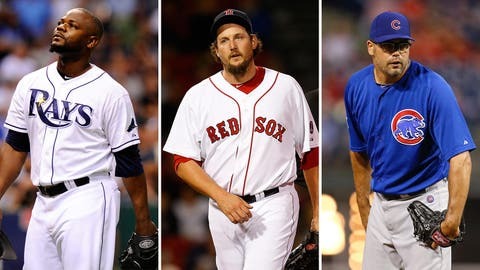 Righties Jake Peavy and Ryan Dempster appear the most expendable, but the Sox could get a bigger return if they moved righty John Lackey or lefty Felix Doubront. Of course, Lackey also is valuable to the Sox — he’s under club control for two more years for less than $16 million, thanks to his Tommy John surgery that added to his contract a club option for 2015 at the minimum salary. Doubront, meanwhile, surprised the Red Sox with his stellar work out of the bullpen in the World Series. His conditioning sometimes raises concerns among club officials, but some believe he has enough upside to become a No. 2 or No. 3 starter. The Royals, after signing free-agent second baseman Omar Infante, seem unlikely to trade designated hitter Billy Butler or any of their relievers. General manager Dayton Moore isn’t inclined to take a step back after adding Infante, left-hander Jason Vargas and outfielder Norichika Aoki. If anything, the Royals would love a shot at re-signing free agent Ervin Santana should the right-hander’s market somehow collapse. Trade a reliever? Remember, the Royals’ bullpen last season led the American League in ERA, strikeout rate and opponents’ OPS. Butler, 27, would have stood a better chance of getting traded if the Royals had signed Carlos Beltran instead of Infante. In theory, the Royals still could move Butler and take a run at Nelson Cruz, but they already have invested a combined $62.25 million in Vargas and Infante. The Rockies, quietly active all offseason, still could add one more reliever, preferably a hard-throwing right-hander. Free agent Boone Logan will be their third left-hander in the bullpen, joining Josh Outman and Rex Brothers. Logan’s three-year, $16.5 million free-agent deal was a whopper, but the Rockies, A) need to overpay to land free-agent pitching; B) view Logan’s stuff as more dominant than, say, J.P. Howell’s and C) believe that Logan, 29, still has upside. For all that, left-hander Brett Anderson probably is the Rockies’ most important addition; if he stays healthy, he will upgrade a rotation that already includes lefty Jorge De La Rosa and righties Jhoulys Chacin and Tyler Chatwood. First baseman Justin Morneau probably will get the majority of his at-bats against right-handers, with Michael Cuddyer or Wilin Rosario facing lefties; Morneau had an .819 OPS against righties last season, .525 against lefties. Then there are righty Jordan Lyles and outfielder Brandon Barnes, the two players the Rockies acquired from the Astros for center fielder Dexter Fowler. The team received more trade inquiries on Lyles than any player at the winter meetings, according to a source, and Barnes was a popular target, too.